Waste Reduction includes Reject (don't buy it in the first place); Reduce (buy less, buy in bulk); Re-use (esp. containers); Repair (find a needle and thread); Upcycle (turn it into something else); and ... finally ... Recycle. Reject ... how many copies of the yellow pages do you need? Follow link to opt out! Don't let them pile up on the street! Support your local thrift shop that likewise supports folks like you when in need. They are at 215 North Illinois Avenue (see map). #Freecycle: Where unwanted stuff finds a new home. Got stuff you really don't need or want? But it's still decent? Clothes, trinkets & toys, household items, musical instruments? Move it on to someone who can use it! Looking for household, clothing items, or a gift? Come to a Freecycle event to see what has come in and help yourself! We are looking for a new location to host a Freecycle event. Contact us if you can help. Reduce ... You do not need to buy that much bottled water! Drink locally! Follow link for more! If you don't know how, go to the SIU Craft Shop and learn how! Repurposed Materials Inc - check out this website just for more wacky ideas! Recycling promotion is one of Keep Carbondale Beautiful's primary purposes, along with litter control and beautification. Increased recycling translates into more efficient use of resources and also reduces litter and therefore enhances the beautification of the city. Keep Carbondale Beautiful seeks to educate the public on the environmental and economic benefits of recycling and to initiate more participation through efforts such as the Spring Clean-up and Recycling Day. 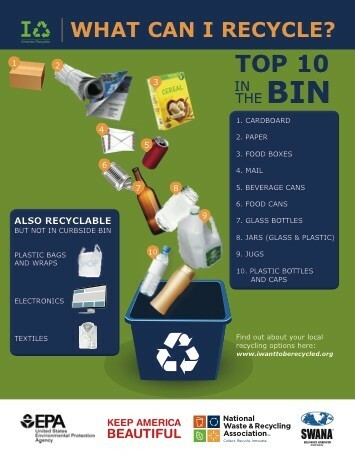 Click here for details on local recycling locations. Click here to see what SIUC is recycling. Click here for 17 stores that reward you for recycling. ​Click here for more recycling ideas. Where can I take this?